Let sit for 10-15 minutes before cutting. Your recipe is lovely, Kathy. I am also secretly delighted that the video features a spinach version— usually the veggie is the “option”; But I personally think that spinach makes a better lasagna — it gives it that green, which makes it a shade lighter than the very meaty kind. I don’t make a ricotta mixture, but what I do do, is to make a white sauce. I layer that along with the spinach and the cheese. I have to agree with Will! Spinach lasagna is one of my all time favorites. I know what I am going to have for dinner. Thank you. I must agree with Will! Spinach lasagna is one of my all time favorites. I know what I am going to have for dinner. Thank you. A white sauce layer instead of the ricotta layer is fantastic in Lasagna. It works particularly well in seafood lasagna. I’m glad to hear the spinach is a hit. I love making lasagna but it always seemed like such an ordeal to boil the pasta then transfer it (hot!) while not breaking it. I just love your easy cooking ideas , no-bake expanding pasta! I’ll have to check that out. But my real problem was getting a nice even layer of the spinach with the sticky ricotta. 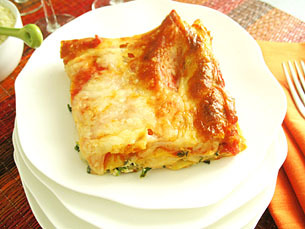 I’ll definitely try this recipe and combine the ricotta and spinach for my next lasagna night. Just one question, if I wanted to add mushrooms to my lasagna, and I love mushrooms, should I also mix that with the ricotta and spinach or do you think it’s better to just layer the mushrooms on top? I think it might be best to sauté (fry) sliced mushrooms in a small amount of olive oil before adding them to the lasagna. If you just added raw mushrooms they probable would not get cooked enough and they would make the whole lasagna watery as well. I would then add them as their own layer. After layer one, spread the mushrooms out over the cheese them continue on with layer two. Let me know how it turns out! Kathy, I love your videos and have only just had a chance to drop in on your website. I’m so glad to have discovered a way to share my appreciation for your recent spinach lasagna video. It was great! It makes cooking look so approachable and easy, I’m fixing to head to the grocery store and buy my ingredients now. Please don’t change a thing and keep the fantastic recipies coming. Thanks! Dear Kathy; I love your videos, they present everything fast and well done… My suggestion about lasagna is that you cover the baking pan with aluminum foil and bake for 20 minutes (avoid overcooking); uncover and cook a bit more for crunchiness… Also add the cheese topping right from the beginning… It works fantastically well. Thanks Rene! Next time I do Lasagna I’ll give your way a try! Wow!!! This lasagna came out deeeelicious! Thanks to you my boyfriend thinks i know how to cook! Thanks! jj that’s wonderful! Good luck and if you have any questions be sure to let me know. Diane from Parents Magazine just said: “I made the spinach lasagna (with nonfat ricotta cheese and low fat mozzarella and everyone loved it.” Thanks Diane for the tip! I love Lasagna.. and I’m going to attempt to make it tonight.. :o) got all of the ingredients the moment I saw your video… what are some other vegetables I could add to my lasagna..
Sauted mushrooms would be fantastic! I used your Spinach Lasagna recipe last weekend and the dish turned out GREAT! My husband was so pleased. It’s just the two of us so we enjoyed leftovers. I just wanted to say thanks for the great recipe and video. Thanks Marlene! You are so right – Lasagna is great straight from the oven or reheated as leftovers! I have never made lasagna, but my boyfriend had been craving it. So I was searching the web for recipes and I came along your website. I made it last night, he loved it and so did I. Thanks for this great simple recipe, I love your videos I am a visual person and I love how you show the process step-by-step. Thank you! This recipe is great for beginners. Not having to pre-cook the noodles saves a lot of time! i’m going to try your recipe for the spinach lasagne for guests i’m having. my question is can this me made the day before? If so, do you bake it when prepared or refrigerate it and bake it on the day when needed? You should be fine assembling this lasagna the day before you are going to bake and eat it. Once the lasagna is assembled, cover it and put it in the refrigerator. Remove it from the refrigerator about one hour before you are going to bake it. Easy lasagna recipe video: Here is the secret on how to create the magic layers for an amazing pasta meal.